Renewed in spirit — and in the challenge that the laity of the Precious Blood groups in Chile received in their annual meeting as members of the Family of the Blood of Christ — we three Congregations of the Precious Blood in Chile give thanks to the Lamb of God for revitalizing our groups on August 19. The theme of “The Vocation of the Laity of the Precious Blood” attracted around 100 members of the groups that unite to deepen their spirituality of the Precious Blood. Santiago, Purranque, Valdivia and Pichilemú were the cities represented. 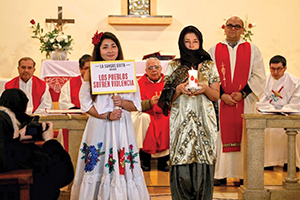 At the same time, we celebrated 60 years of presence in the country for we Sisters of the Precious Blood; 70 years of the Missionaries of the Precious Blood in Chile; and 130 years of the founding of the Chilean Religious Congregation of the Precious Blood. What a coincidence, all in years of seven: 1957, 1947 and 1887. Andres Diamante, one of the members of the groups from St. Gaspar College, gave the opening conference to lead us to perceive the “Shouts of the Precious Blood” in our world today, where we feel we are called to respond. Many challenges were suggested. Many centered around the respect for the human rights of all people and openness to the many immigrants entering the country, principally from Haiti, Venezuela, Colombia, Peru and Bolivia. Also discussed was respect for the life of the unborn, which is in Congress and the Constitutional Court of Chile at present. We also touched on respect for the elderly. Around 25 percent of Chile’s population is made up of senior citizens, but many suffer from low pensions and lack the necessities of life. Several of the Haitian community from Our Lady of the Precious Blood parish were present. Some are here about two months, so the languages of Criolla, French and Spanish help us communicate. The aspect of the threat of war and unrest in so many countries was also a preoccupation. All these needs and challenges to PRAY and get involved in solidarity works with the above led us to celebrate the Eucharist to finalize the day. At the offertory procession, children who have died and/or live in government homes for children were remembered. Over 1,000 children have died in these homes in the past 10 or more years. Two young ladies represented the countries of Syria and Venezuela with their typical dress to plead for the end to the disasters in those countries. These and other petitions filled our hearts as we interceded that the Blood of Jesus protect us, save us and strengthen us for the challenges in our world today and in Chile. Two young ladies represent the countries of Venezuela and Syria with their typical dress to plead for the end to the disasters in those countries.